The current study is the largest clinical trial to date of the efficacy of DBS as a treatment for severe depression. 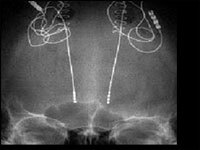 Between May 2003 and November 2006, Andrez M. Lozano and his colleagues implanted electrodes into the brains of a total of 20 patients (9 men and 11 women) with major depressive disorder, all of whom were referred to the researchers from hospitals or community psychiatrists, after failing to respond to antidepressants, psychotherapy or electroconvulsive therapy. On Neurophilosophy a post about this new trial with this new treatment for treatment resistant depression. 12 out of the 20 patients reported significant long-term improvements in their condition. This was corroborated by neuropsychological assessments which measured, among other things, the patients’ mood, anxiety levels and sleeping patterns. These improvements were observed within 1 month and, importantly, persisted for at least 12 months after the treatment, by which time 7 of the patients had gone into full remission. Time for some randomized controlled trial with switching on and off? I see many of your posts are a few years old. I was diagnosed w/ clinical depression @ 19. Talking w/ a psy, we were able to recognize it in my life as early as 7 years old. I am mid-life now & taken almost every level/type/combination of antidepressants, anti anxiety etc to no avail. I have now been put on permant disability because of what is now called Major Depressive disorder. Because of disability, I am on Medicare. With my history of unsuccessful treatment (14 pills a day now) at a large monthly cost to medicare for scripts/therapy and monthly psy. appoiontments, would medicare consider reimbursement for someone who has tried everything. If this works, my cost to the government would decrease immensely. The thought of being depression free, or depression “lite” makes me cry as I type this. As of 2010/11 does anyone foresee medicare helping me w/ these costs? I live on $940 a month and cannot do this by myself. In the past I have asked my Dr. about ECT and have signed up for studies with the NIH. My sister works for the FDA but we are estranged, as is with my entire family. I have been self isolating more and more as my depression and desperation increases. DOES ANY ONE HAVE ANY SUGGESTIONS? Thank you!